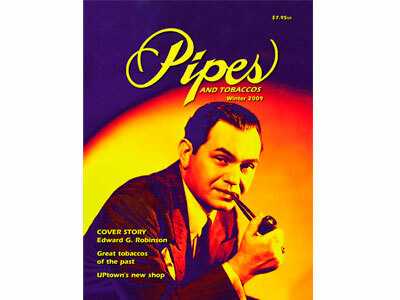 I wonder if EGR mentions what he smoked in his autobiography. He probably couldn't say or it could hurt sales of his brand name tobacco. I'm interested in this 60s article now. Jim think of it the way you might imagine celebrity endorsed perfume. Britney Spears describes a fragrance she likes and the company gives her ten or so options to choose from. I imagine EGRs pipe blend similar to this. He might have smoked the first batch and said more latakia or more topping or whatever but at the end of the day he was a connoisseur and probably had his favorites. I'd love to know what they were. I don't recall him mentioning the tobacco in his book. And yes, I know a lot of celebrities lend their names to things they don't actually use, but that doesn't mean they all do/did. Arthur Godfrey only endorsed products that he liked. Same was true of Paul Harvey, among others. I think you paint Robinson with too wide a brush when you don't have any facts to back it up. You could be right for all we know, but we don't know. I'll give him the benefit of the doubt because I have no reason not to. Don't get me wrong I'm a huge EGR fan and I've probably watched Little Caesar more times than any other movie. I'm only going by what his granddaughter said about him smoking dunhill and having a humidor at the dunhill shop. I understand. I don't doubt that what she said is true, but you've done a lot of speculation, and my point is that you don't have enough information to accurately make some of the assumptions that you've made. As a professional biographer, I have learned not to take just one source, especially from some one who wasn't around or alive at the time of the subject at hand (in this case, the origin of the EGR blend) as a definitive answer to a question. It's not best evidence, though at this late date, it may possibly be the only evidence, unless there's somebody still alive who was there at the time to talk to. But there's nothing wrong in having the discussion. Anyway, I think we've gone as far as we can with this for now, so let's talk about the tobacco, which I like and am glad to see it sell. I have a personal interest in it since I worked so hard to get the word out to save EGR from being discontinued, and to get Sutliff to sell it in 1.5 ounce tins so more people (like me) would be willing to try it. Companies don't often listen to outsiders or customers, but Sutliff did, and we all benefit from it. It stays around, I get to smoke it every day, others who like it know it'll stay on the market so they can smoke it, too. And, I like the idea of seeing Edward G. Robinson's name live on in places where it might not have before. I know there are a number of people who didn't know who he was until this campaign started, and I take some joy in changing that a little. Thanks richard! Is there anyway to read the article online? I think so. Call Marilyn Jackson @ 919.327.1597. Or 919.872.5040 ext. 238. Rande, glad you enjoyed your first bowl of EGR. I'm nearing the end of my tin, having smoked several bowls whilst on a little R and R trip north, just off the Mt. Baker Hwy for the weekend, and need to get another order placed asap. Thanks Richard. Well atleast we know now that EGR liked peretti 102 & and that EGR was based on his fav dunhill blend. It sounds like He was a fan of burley. Any theories as to what the dunhill blend might have been? Not a clue. A lot of the well-heeled had/have their own blend recipes on file at Dunhill, with their cigar storage lockers, etc. I don't see what difference it makes, other than being a curiosity. Einstein smoked Revelation, for instance--that's good enough for me. Probably liked the name. Smoking my first bowl of this stuff. It's not bad much better than the other OTC I've tried. Oddly enough the topping is exactly what I imagined it to be like. I feel like I've smoked this stuff in another life somehow.